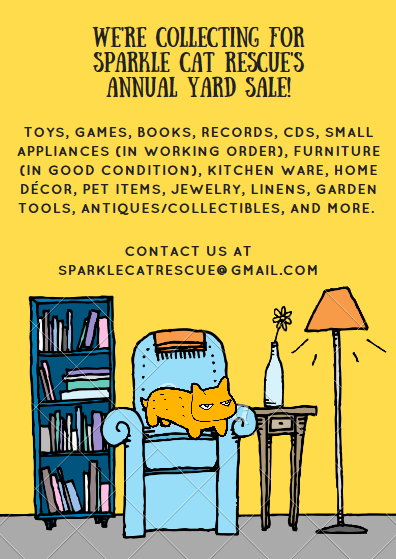 Sparkle Cat Rescue needs volunteers for our 2019 Yard Sale! 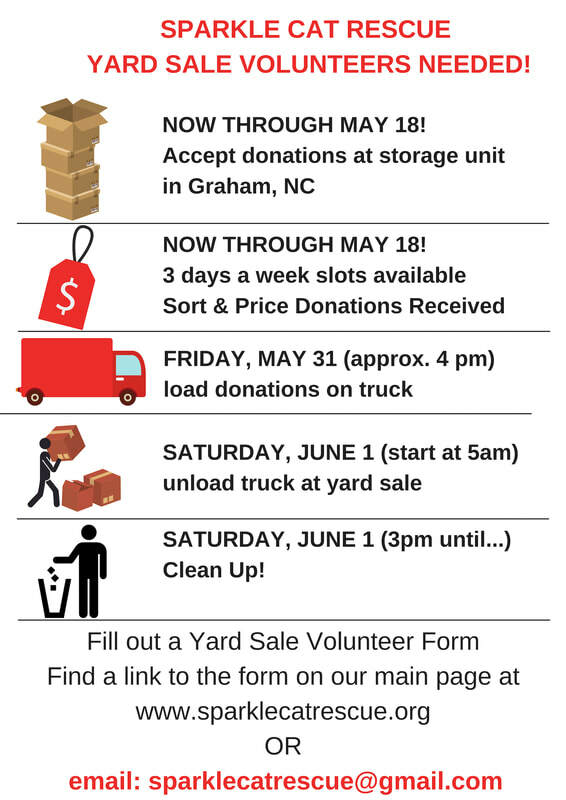 The yard sale/bake sale/plant sale will be held on Saturday, June 1, 2019 from 8am-3pm in the parking lot at Just Save Grocery Store off Main Street in Graham, NC. Donations are being accepted through May 18, 2019. ***Volunteers start unloading trucks around 5am on June 1, 2019. ***Volunteers needed throughout the day in 2-3 hour increments or volunteers greatly appreciated that would stay at the event all day and help clean up after the event. ***Volunteers most needed for: Pricing/Sorting, Loading/Unloading Truck, Clean up after event. - 3 days a week (Tuesday, Thursday, Saturday) - help one day a week or more. Volunteers get FIRST DIBS on purchasing yard sale items in advance of the yard sale! Please complete this form and hit SUBMIT to contact us regarding VOLUNTEERING to help with the yard sale. Once we receive your volunteer application, we will contact you.